Welcome to the CustomXC Cross Country Colours Designer! Here you can design your perfect xc colours, it's simple and fun! You can even get a matching hat cover, go to 'Hat Cover' or click here to start designing your hat cover. 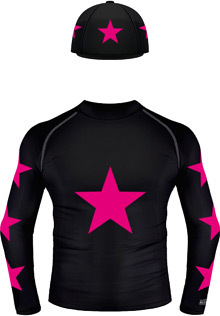 CustomXC is the home of personalised and bespoke cross country colours. From new riders to world class professionals, we help thousands of riders every year create their perfect cross country colours. With our easy to use designer creating your perfect colours is simple and fun. Performance and comfort – choose the colour, fit and construction to suit your style. Personalise your kit with classic XC designs or can't-miss graphics in colours of your choice. Enhance your colours with your choice of text. Names, Teams, Sponsors: the choice is yours. Complete your XC set with a fully customisable high-quality hand-made hat cover. Thanks to our unique process your bespoke colours are ready in just 5-10 days, often sooner. I have to say my colours are just incredible! - I love them so much! I would not hesitate to recommend CustomXC to anyone looking for splendid and very professional XC colours. Thank you so very much. Love your company, will keep coming back as long as i am eventing! Just like to say a massive thank you for the hat silk, it arrived today and it looks great!! Love my CustomXC baselayer, looks great out on the course and is brilliant at keeping you warm and dry in the unpredictable UK weather! Just to say a HUGE "thank-you" for the delivery today - I am absolutely delighted with the "colours", so smart!! I am so pleased that my Custom XC kit arrived in time for my first event of the Winter. Looked so good and the quality is great. Will definitely be making another order from you soon. Thank you so much. Just to let you know that the colours have arrived and they look fantastic, thanks so much. We are looking forward to wearing them at the BRC Championships next weekend!! Just to say the xc colours turned up on Friday as you promised and look fabulous. The BE went very well (probably because she looked so fab in the new xc colours!). Thank you! My colours were really comfy and we looked very smart! Thank you again for my colours! Thank you on my colours! Had so many compliments on them. Big thumbs up, I absolutely love them! I feel your products are very high quality, and I have a personalised base layer and hat silk from you and I absolutely love them. I use them every time I go cross country. I have some CustomXC Colours and am thoroughly pleased with them. The quality and appearance are 5*. Thanks so much for doing our last minute order. The colours arrived on time and looked amazing,my daughter was so pleased to wear them proudly at her first BE event. I have just received my CustomXC colours and they are amazing!!! Just how I wanted them to be. I am one very happy customer! XC colours have arrived on time and we are absolutely delighted with them. Thank you so very much for your prompt service and professional attention to detail. Thanks again for a great quality kit, and a super service. Once again we won Best Turned Out so I am sure I will be back for another set next season! Just got the colours and they are wonderful - again! Thanks very much! I just wanted to say thank you for my XC colours. I love them! Mum loves that she can spot me on the course! I love my kit and people have commented how professional we look so I have you guys to thank for that! Jenna very pleased with her outfit, and even better she came 1st in her XC - plus all her friends loved her outfit! Thank you for our fabulous Custom XC colours!! We always get loads of positive comments about how awesome they look out XC! What's better is myself and my friend now have a set of colours for our XC Team 'Orange is the new black!'. I just wanted to say thank you for your amazing service! I ordered 3 different XC baselayers, they arrived in 3 days and are absolutely perfect! I would definitely recommend you to any of my friends! My Long Sleeve Polo is great for the warm weather, will definitely be ordering again! Thank you for our lovely colours, we had lots of fun with them and lots of compliments on how smart they look! I received Polo and hat cover last week and I absolutely love them! Great job! Thanks again! I absolutely love my XC colours. They are very well made and exactly as I hoped they would be from the design on the website. I would highly recommend them! They arrived this morning, they're great, my daughter is going to love these on Christmas Day!...thank you so much! I just wanted to email to say that my custom xc country colours have been amazing a year on! Will definitely purchace again! I ordered some colours off you and just want to say I love them! They look great and are super comfy to ride in! So again thank you and will definitely be ordering some matching stuff for Tilly ready for next season! Thank you so much, they arrived in time and they are fantastic! He was delighted with them, will definitely recommend you to others! Thank you for my colours, they look fantastic. I feel so amazing when I wear them, it makes me feel the part too! The commentator said how amazing we looked and it made me feel on top of the world! My XC colours arrived today and they are absolutely stunning, exactly as I expected them and even better quality than I expect! Just wanted to say thank you so much for my XC colours! They were worn for the first time today and I love them! Thank you again, especially getting them to us in time! Thanks so much for sending out our cross-country colours so quickly. The colours are so vibrant and look fab! Thank you too for making the whole process so easy. Just wanted to say thank you! My amazing new colours arrived today and they are perfect! The fit is perfect and I love how the colours have come out. The cross country colours arrived and look great - they have been worn a few times already - many thanks for your prompt service we will recommend you to others. Just to let you know the girls absolutely love their new colours, they say their friends are all really jealous!! I received my xc colours today, thank you so much for getting them to me in time. I'm delighted with them. Our colours have come and they fit perfectly. We are very pleased with how they turned out. Thanks for everything. The site was really easy to use and I got just what I wanted, thanks! Just a quick message to say thank you and I am really pleased with my XC set, thank you! Thank you for my colours, I really stood out on the course! Good in the hot weather too! Thank-you very much for the brilliant XC colours! Brilliant quality and make me feel like a pro. We absolutely love Custom XC products and always look so smart wearing them in the XC phase! The designs are slick and smart, with so many options and colours to choose from, they’re fantastic value for money! My order just arrived and all I can say is wow! Amazing quality, the colours are a match to how they looked on the screen and the fit is perfect! Just to say that my daughter was thrilled with her XC colours. Thank you so much for all your help and I hope that 2016 is a successful year for you all. Received my baselayer and I absolute love it!!!!! Thank you so so much for getting it to me for Sunday!!! Thanks again hugely appreciated ... Great customer service. Thankyou so so so much for my FANTASTIC xc colours! I had so many compliments on my colours and lots of my friends will be ordering from you soon. My cross country outfit was amazing quality, thank you! Very good :) Many thanks! We came 4th at our first ODE and def stood out from the crowd in these amazing colours! Thanks CustomXC! Wow, what amazing service. Thank you to everyone involved in getting my daughters order to her in a very quick time. The quality is great. Thank you again. Thanks for my colours, they are super and make spotting me amongst a sea of bay horses much easier! I've just received my colours - thank you so much for extremely fast delivery in time for the weekend and gorgeous baselayer. It's perfect!! Just to say a massive thank you for the xc colours. My daughter is so delighted with them - they are perfect! Morning, received my top and love it. Second one I've had now (different colours to match in with my horse :-) ... such great quality. A big thank you for all your help this week in managing to get me my xc colours on time! I will happily recommend your company to eventers and hunters alike. I just want to thank you for such swift delivery of the xc colours. I only ordered them a few days ago. Thrilled, my daughter cannot wait to wear them. Just wanted to say a huge thank you for India's Cross Country set!! What an amazing company and customer service, will definitely be recommending you to everyone.. I am emailing to say a huge thank you as my colours are absolutely fantastic and I am over the moon with the fantastic service I have received! I will be sure to recommended you to all my eventing friends! My colours came today and I love them! I will definitely buy products from you guys again! Have just taken delivery of Ellie's new colours, absolutely fantastic, it looks super smart. Thank you all SO very much for turning it around so quickly! Love love love my XC colours, I wear them to every event and they look fab! I love the way you can personalize every aspect of your colours. I love how easy your website was to use and thought it was great value. I won't hesitate to recommend your company to anybody looking for XC colours in the future. Thank you so much for my lovely XC colours! Really pleased with them! Thank you so much for your fast and professional service. The quality of my XC shirt and hat silk is great. My colours have just turned up and look fantastic. I'm looking forward to wearing them this weekend. I've received my XC colours and I'm very pleased with them. Thank you very much for the excellent service I will most defiantly be recommending this company. Just like to say a big thankyou to you guys for my XC colours, I received them today and I absolutely love them! I bought a saddle blanket, helmet cover and silks, all matching and can not wait to get out competing in them!! We have received the colours and all of the team love them! Thank you so much for all your help, we will be recommending your services very highly! I absolutely love my XC colours we get noticed everywhere we go! Thank You for the fabulous service!